You might not think a cabana could outshine a glistening blue pool—especially in the Texan heat—but this Pool House in West Lake Hills is a scene-stealer. 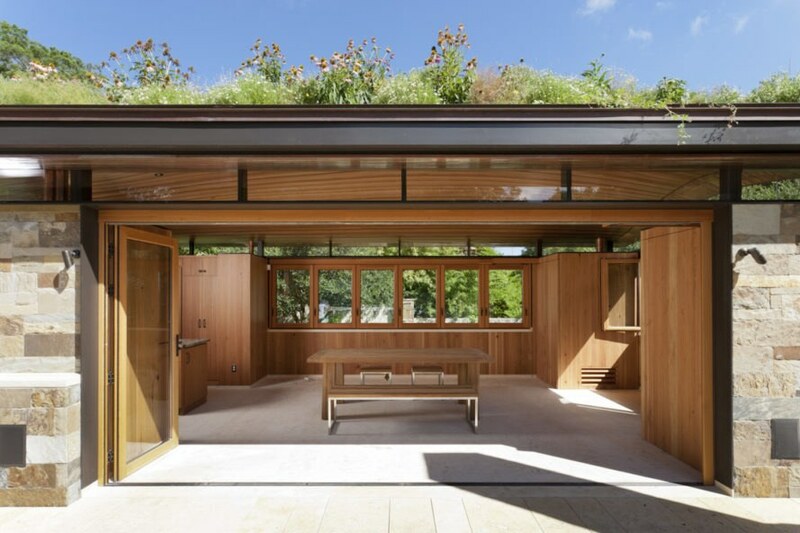 Murray Legge Architecture designed this dwelling topped with a flourishing wildflower green roof – and it’s so beautiful we can’t help but wonder what the main residence looks like. The pool house was also designed to minimize impervious surfaces and aid in the management of stormwater runoff. A modernist beauty, the City of West Lake Hills Pool House and the surrounding area emphasize clean lines, steel framing, and glass. Light-colored stone stairs leading down to the pool are raised off the slope to allow water to pass through, while grasses grow in the space between treads. An innovative suspended and permeable stone terrace system surrounds the L-shaped pool. Stone also makes up much of the Pool House and are stacked in large blocks to give the exterior a beautifully textured appearance. Glazing wraps around the front of the building and opens up to create an indoor-outdoor dining area complemented by an outdoor wood stove and high-end residential kitchen. Timber is featured prominently in the Pool House, where it lines the interiors and is used for furnishing. The vaulted roof arches upwards, echoing the surrounding canyon hills, and gives the structure a more airy feel. “Impervious cover and storm water run-off regulations within the city are very restrictive,” wrote the architects. 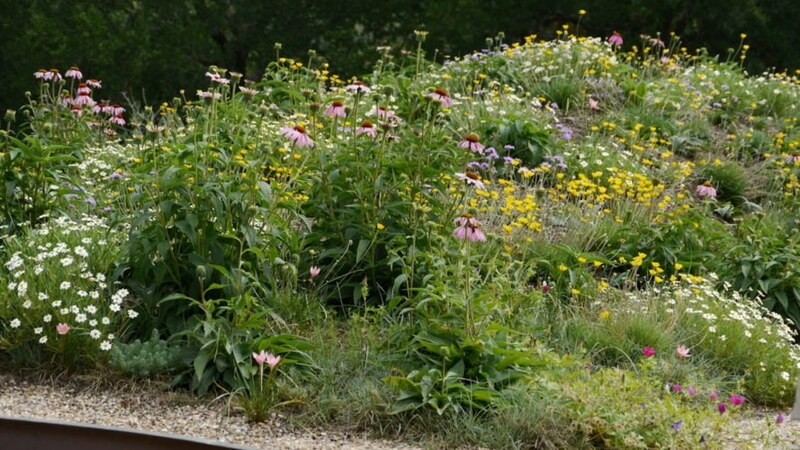 “The City of West Lake Hills granted a variance to allow the construction of a garden roof and accepted it as permeable cover through a variance process. This variance was a first for the City of West Lake Hills and points to the city’s progressive environmental policies.” The architects also added that they stacked much of the project’s equipment and programs beneath the green roof to minimize impervious surfaces. You might not think a cabana could outshine a glistening blue pool—especially in the Texan heat—but this Pool House in Texas’ City of West Lake Hills is a scene-stealer. 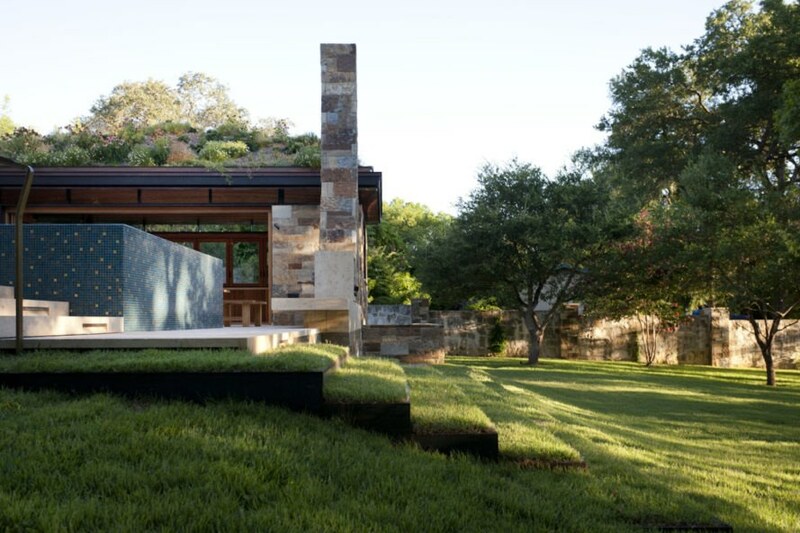 Murray Legge Architecture designed this dwelling topped with a flourishing wildflower green roof in a project that’s so beautiful we can’t help but wonder what the main residence looks like. The pool house project was also designed to minimize impervious surfaces and aid in management of stormwater runoff. A modernist beauty, the City of West Lake Hills Pool House and the surrounding area emphasize clean lines, steel framing, and glass. Light-colored stone stairs leading down to the pool are raised off the slope to allow water to pass through, while grasses grow in the space between treads. An innovative suspended and permeable stone terrace system surrounds the L-shaped pool. Stone also makes up much of the Pool House and are stacked in large blocks to give the exterior a beautifully textured appearance. 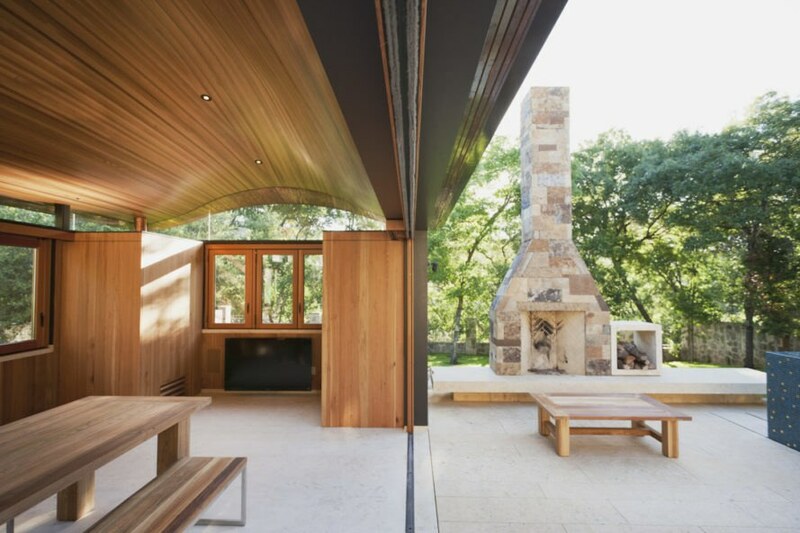 Glazing wraps around the front of the building and opens up to create an indoor-outdoor dining area complemented by an outdoor wood stove and high-end residential kitchen. 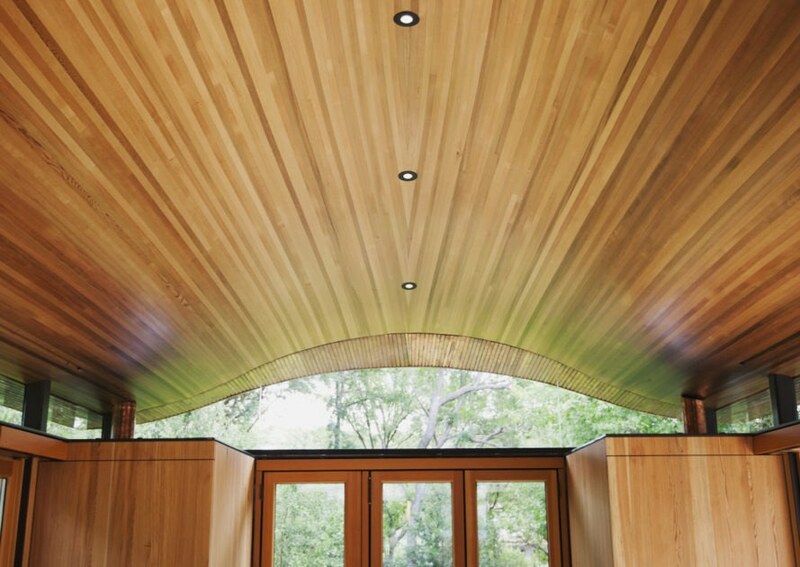 Timber is featured prominently in the Pool House, where it lines the interiors and is used for furnishing. The vaulted roof arches upwards, echoing the surrounding canyon hills, and gives the structure a more airy feel. The architects also added that they stacked much of the project’s equipment and programs beneath the green roof to minimize impervious surfaces. You might not think a cabana could outshine a glistening blue pool—especially in the Texan heat—but this Pool House in West Lake Hills is a scene-stealer. 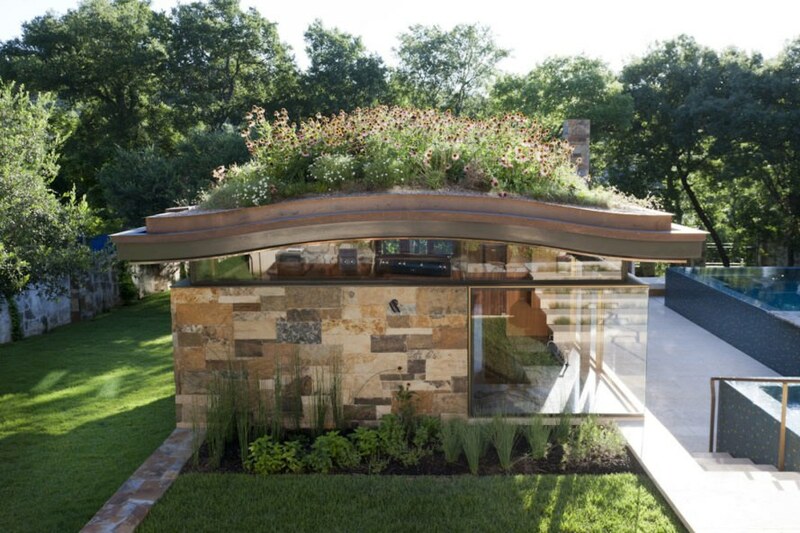 Murray Legge Architecture designed this dwelling topped with a flourishing wildflower green roof - and it's so beautiful we can’t help but wonder what the main residence looks like. 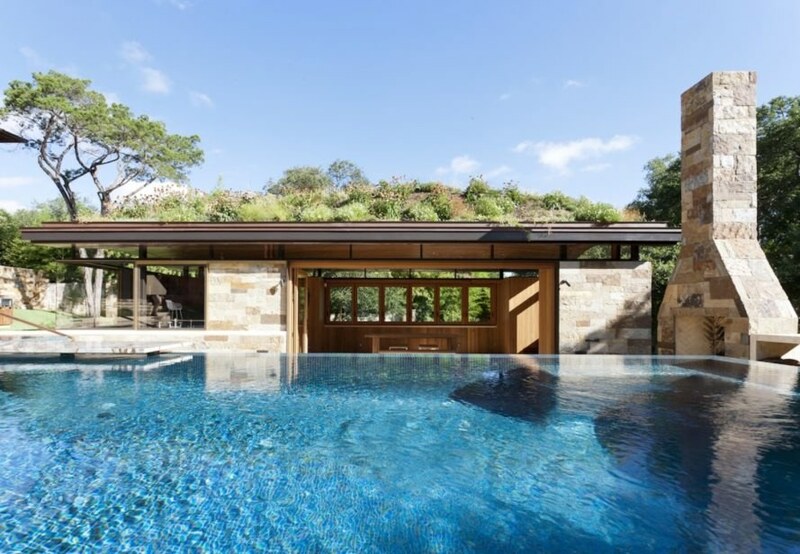 The pool house was also designed to minimize impervious surfaces and aid in the management of stormwater runoff.